When i first saw this 'madness' advertised on Annie's blog, i thought ''Oh yeah...great!...gotta sign up for this'' I love all the Halloween stuff.... but then i thought I'm not really into monsters though.... what'll i do? So.... after a lot of thought.... a lot of head scratching...NO not nits!.....i wondered what could be more monstrous than a VAMPIRE ALICE IN WONDERLAND? What havoc she could cause! 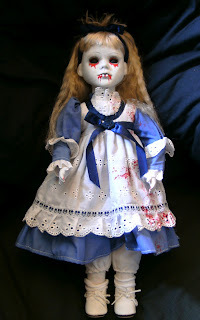 I altered a porcelain doll....revamped her clothes and hair..... gave her a spiky bit on top...so un-Alice don't you think? 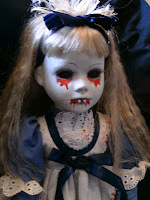 Bloody fangs....bleeding black eyes and a really messy blood stained apron/dress....shes one messy feeder! 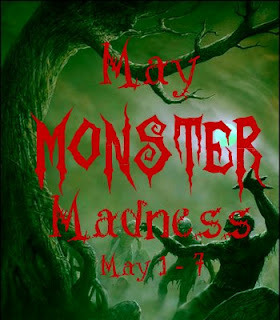 The whole blog roll is on my side bar and shall stay there for the 7days of MAY MONSTER MADNESS.....if you're a bit strange like me, you really need to check these blogs out. My huge thanks to Annie for organising this event..... and I'll see you all tomorrow for more madness and a more normal DT posting. hahah I think she rules. those eyes to me are gorgeous. wish mine was that color sometimes instead of blue. maybe 1 blue 1 black. yea that would be cool. where in the world do you get all these dolls. I love how you revamped her hair. awesome. You rock. I cant wait til the yardsales start around here I have so added to my "keep an eye out for" list. I'd like to go to one of ya'lls what do they call them? "Car Boot's" Is that right?